The UK's oldest environmental charity faces closure because its income has been hit by cuts to local authority budgets. Environmental Protection UK was originally established in 1898 as the Coal Smoke Abatement Society. It says it will stop functioning as a fully staffed and funded organisation in March 2012. However, it hopes that it can carry on with at least some of its work on a voluntary basis. Environmental Protection UK is a charity that provides expertise, advice and analysis on air quality as well as land, waste and noise issues. Much of its income comes from local authorities through membership fees, publications and services. As council budgets have come under pressure the charity says it has faced considerable financial challenges. Outgoing Chief Executive James Grugeon said: "Local authorities have been forced in the past year to make very difficult funding decisions, following severe cuts to their budgets imposed by central Government. "Within this economic environment, EPUK has faced an uphill battle to survive which, ultimately and despite our best efforts, we haven't been able to win." The charity has its origins in the Coal Smoke Abatement Society (CSAS). It was founded by London artist Sir William Blake Richmond in response to winter smog caused by coal smoke. 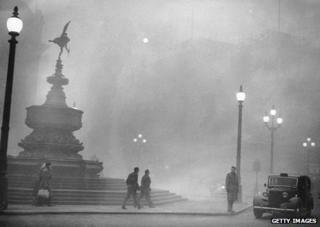 The Great London Smog in 1952 is believed to have led to the deaths of up to 12,000 people. CSAS's work contributed to the introduction of the 1956 Clean Air Act. Later it changed its name to the National Society for Clean Air (NSCA). In October 2007 it was rebranded again to become Environmental Protection UK. The organisation will close as a fully funded and staffed charity at the end of the financial year with the loss of 10 jobs. However, it hopes that it can continue work if there is a commitment from members to continue on a voluntary basis. A decision is expected to be taken in January. The charity recently launched the Healthy Air Campaign and says it is still committed to that and other projects. Its Scottish division is looking at the possibility of becoming its own stand-alone organisation.